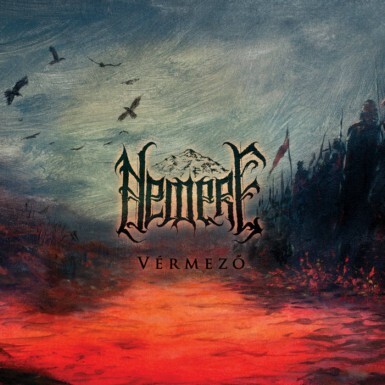 Nemere are a band from Hungary that plays a very raw form of black metal and this is a review of their 2017 album "Vermezo" which was released on cassette by Neverheard Distro. Nature sounds start off the album along with some whispers and heavy riffing a few seconds later which also leads to a very fast and raw musical direction which also uses a great amount of tremolo picking and blast beats as well as introducing high pitched black metal screams onto the recording. All of the musical instruments on the recording have a very powerful sound to them while the music is very heavily rooted in the 90's second wave tradition as well as sounding very modern at the same time along with a small amount of growls and the songs also bring in a great mixture of slow, mid paced and fast parts, a brief use of semi melodic singing can also be heard and as the album progresses acoustic guitars can be heard on a couple of the tracks and a later song also adds in a bass guitar lead for a few seconds. Nemere plays a style of black metal that is very raw, traditional and old school sounding, the production sounds very raw and heavy while the lyrics are written in Hungarian and cover Anti Christian, Nature and Ancient Hungarian Life themes. In my opinion Nemere are a very great sounding raw black metal band and if you are a fan of this musical genre, you should check out this cassette. RECOMMENDED TRACKS INCLUDE "Harci Dal" "Vermezi" and "Utolso Utam". 8 ou t of 10.